Much of Cape Meares was platted with the Bayocean resort as part of the same Bayocean Park subdivision. Their fates have been intertwined ever since. The Mears Street [sic] and 2nd Street shown on the original plat map above were both lost to the sea the same way, and over the same time period, as the town site of Bayocean. This is why modern-day Bayocean Road (Meares Avenue and 13th Street inside Cape Meares community) ends at 3rd Street instead of 1st or 2nd. You can see more clearly what fell into the sea at Bayocean Lots In Pacific Ocean. 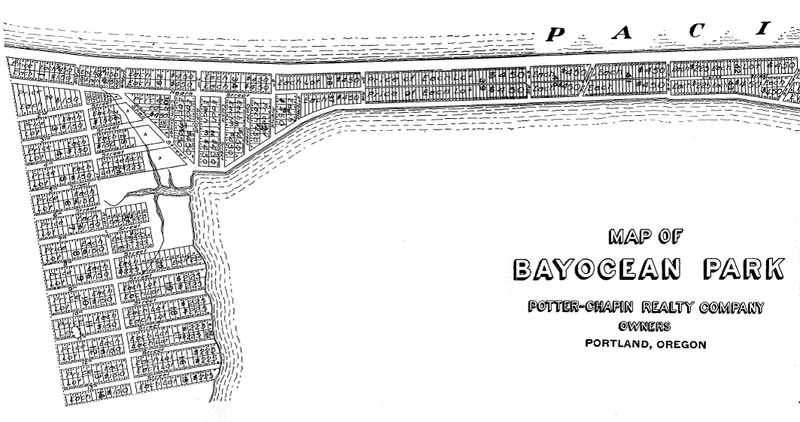 Though concrete roads were constructed on Bayocean early on, there was no way to drive cars to them from the outside. The first version of today's Bayocean Road wasn't built until 1926, when Francis and Ida Mitchell - who owned a grocery store and hotel on the bay side of Bayocean - got tired of waiting for Tillamook County's help and built their own dirt and plank affair (Oregonian, July 11, 1926). In 1928 the road was improved to the standards of the day by a cooperative effort of the county and other Bayocean property owners who were awarded T.B. Potter Realty assets after thirteen years legal action (Oregon Journal, Sept. 2,1928). Where the road turned north from Cape Meares, its name was changed from Mears to 1st Street. Once it crossed over to the bay side it was called Bay Street. The most prominent of the Bayocean immigrants was its schoolhouse, which now resides at 5690 4th Street NW, and serves as a community center. 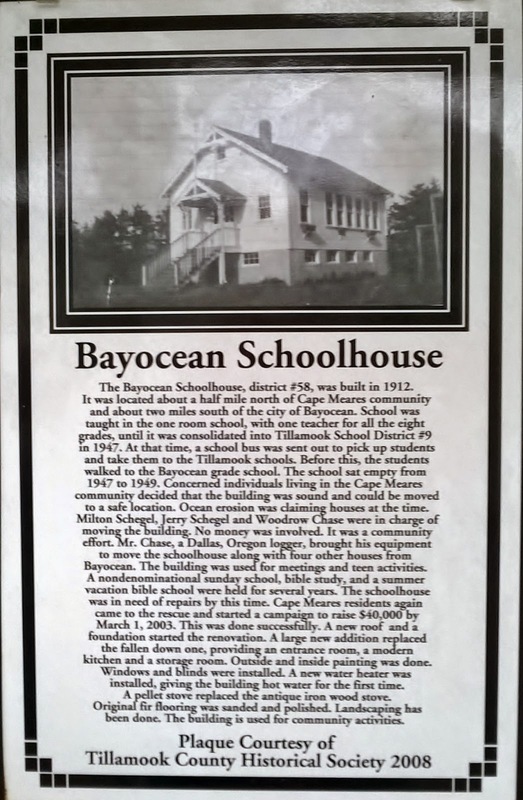 The schoolhouse and Pagoda houses were the earliest to be moved off Bayocean - in 1949. A history of the school, written by Barbara Bennett, is depicted on a plaque next to the front entry. You can read by zooming in on the photo here (the Milton Schlegel mentioned was Barbara's father). 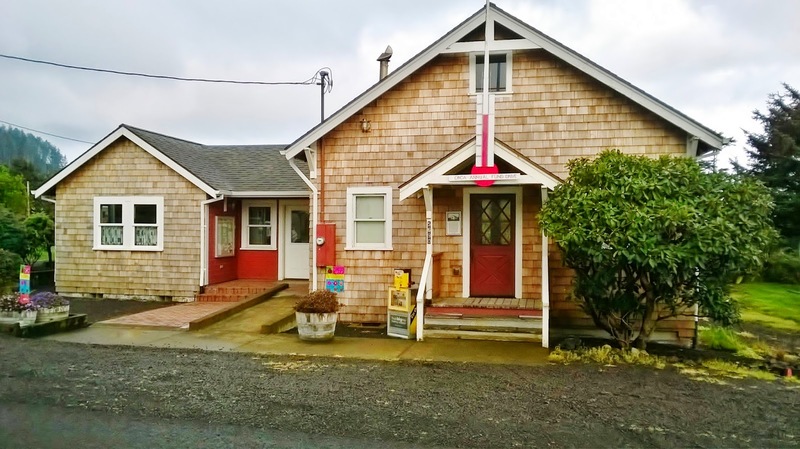 The Cape Meares Community Association added to the building and maintains it. Barbara Bennett lived in Cape Meares then, and still does. She recalls attending Bayocean School in 7th grade and graduating from 8th grade there in 1945. Among her fourteen classmates were her brothers Jerry and Jim Schlegel, Perry Reeder, Ernest Knutson, and the Bennett siblings: Harold, Rosemarie, and James. Barbara married James Bennett. 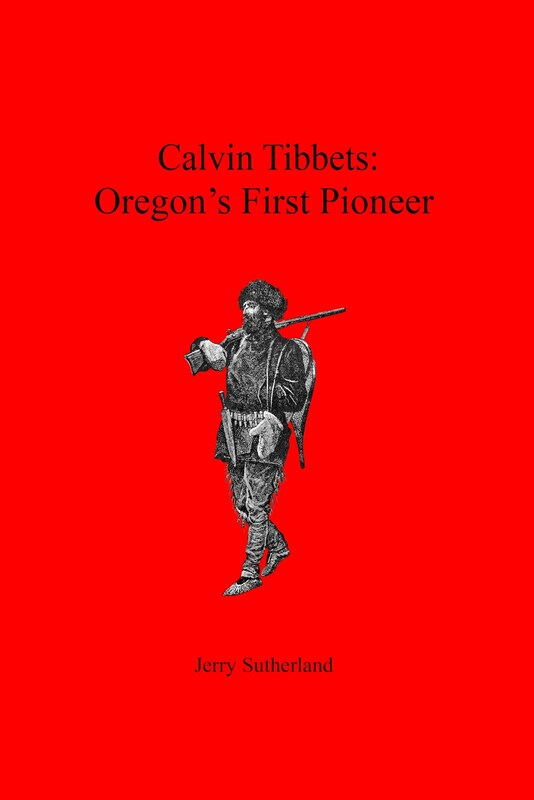 He was interviewed by Rick Dancer for a video called "Oregon Ghost Towns: Bay Ocean, the saddest story of all" before passing away in 2014. Barbara writes the "Cape Meares Fencepost" column for the Tillamook Headlight Herald. The Webbers said that six homes were also moved to Cape Meares before the sea could take them (see "Buildings Moved" in right column). They included the house of Lewis Bennett (James' father) even though his approach was a bit different: "He took it apart board at a time and moved it to his lot in the Cape Meares Community. All he lost was his garage and his wife's daffodils." 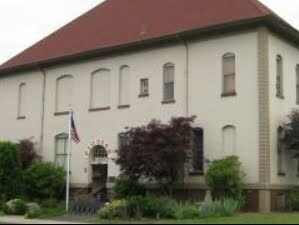 According to Lewis' son Harold, the boards were barged over to Bay City by the U.S. Army Corps of Engineers and stored there until they were used to build an addition to the house the family moved into on Cape Meares. Harold still lives there with his wife MerryAnn. He remembers the house on Bayocean having colorful walls, a carryover from its previous owner, the Rainbow Girls. The Webbers said they found a small board from the Bennett's garage in March 1972 (the rest had fallen into the sea; What Happened at Bayocean: Is Salishan Next?, 24) that was "Rainbow Girls blue."